College athletics can be an eye-opening experience for even the most seasoned player. For many, it is the first time you are really challenged and consistently fail to meet your own expectations. You quickly find out that, for the most part, a college coach's job is to win games, not help you improve. This can lead to a neverending cycle of frustration for you during your 2-4 years. As a result, during your time at school, you fall into one of the 3 categories below. BR U is here to help no matter where you are during your journey as a college player. You were one of the best in High School last year. You entered Fall Ball at your new college excited show why you were a top recruit for your school. But then, reality hit. You realized that everyone on your team is good, some of your older teammates are really good. You play your first scrimmage and the pitchers throw gas, like nothing you've ever seen before. You have some trouble hitting even though it seems like everyone else is hitting...and not to mention they are hitting it a lot harder and farther than you. By the end of Fall Ball, you caught up some to the pace of the college game but clearly not enough. The season starts and you play a little bit in your non-conference games but you struggle. Upperclassmen (and even some of your fellow freshman) are in the line up every day and doing well. You get a few ABs here and there but nothing worth noting. You are frustrated. You're thinking about transferring. You're parents just chalk it up to you being a freshman but you look around the locker room and know you have to do something to get ready for next season. You've been on the team for a year or two now. You love being around the guys, chatting it up in the locker room, and just the chance to play college baseball. BUT, this past season, you really didn't play that much. You started at the beginning of the year but struggled after a few games and never really saw the lineup after that. Most of the guys you came in with (aka your friends) are playing regularly and even some of the freshman are getting starts. You know you have the talent to play at this level but you also know you haven't really proved it on the field. You have a big decision to make this offseason. Do you continue down the path you are on? You can do the same thing you've done the past couple off-seasons: go back to your high school and work out with your old teammates and high school coach. Hey, if you keep doing that, maybe you'll play a little more next year and then you'll definitely start your senior year...right? You start thinking more about it, do you just want to be a role player for another season? You know you don't, so what needs to change? You've always been one of the best and college has been no different for you. From the day you stepped on campus you've been able to hit, field, and throw. It all just comes easily to you. You've been a starter since the start of your freshman year and haven't looked back. You've gotten all-conference honors. You've even popped up on some draft boards. Everything is going good. Hopefully though, deep down, you know it could be better. You know you haven't reached your ceiling. You know you are capable of dominating. You know that even if you get just 1% better this off-season, it could be what you need to push you over the top. You want to prepare yourself for the next level, and while what you usually do in the off-season has worked well, you know that you need to take it to the next level in order to play at the next level. You now see the game as more than a game but as a business...and you want to invest in yourself this off-season and see the returns. BR U, short for Baseball Rebellion University, is THE summer off-season development program (running from May to August) for college hitters on the East Coast. The program is designed specifically to quickly and drastically improve hitters at any level and then give them the tools to continue their improvement beyond BR U, into their college season. BR U takes a holistic approach to your development as a hitter. Through our proprietary movement work, professional staff, and state-of-the-art technology, we are able to raise hitters' ceilings in days or weeks, not months. When you leave BR U, the metrics will show that you left a better hitter than when you entered. You've invested your whole life into this game, that investment shouldn't stop once you get to college. Keep reading to find out what BR U can do for you! We have 5 full-time professional hitting instructors at Baseball Rebellion. What does that mean for a BR U hitter? It means that you are going to get the same top-level knowledge and instruction no matter who you work while at BR U. Our instructors spend their day researching the latest developments in swing mechanics, writing comprehensive research articles, and of course, giving lessons. In short, our instructors are ready for any challenge you throw our way! Every single cage at Baseball Rebellion is outfitted with a HitTrax ball tracking system. That means every swing you take during BR U is recorded, tracked, and analyzed. In addition to our HitTrax system, you will have access to our powerful K-Vest technology, which measure body position and rotational power. We believe that technology shouldn't replace instructors but empower them to help make you the best player possible! Gone are the days of guessing if you are getting better or not. With the technology we have available at BR U, you will be able to track your improvement throughout your entire training. Admittedly, our methodologies can sometimes seem weird to the untrained...but they will make you better! That is why it is so important to us that we PROVE your IMPROVEMENT with you every single day! A typical day at BR U will consist of three to four hours of training per day. The training will be broken up between Movement Training, Individual Instruction, Group Instruction, Live At-Bats, and Strength Training. Our movement-based training methodology is specifically designed so you don't have to hit until your hands bleed. BR U is designed for you to get quality instruction, not quantity repetitions. Learn more about your BR U experience below! A portion of your training every day will be devoted to using the Rebel's Rack to develop rotational power in your swing. This is usually done before instruction but can also take place during lessons. Why? What makes a swing powerful is the way in which the body rotates during the swing. Increase the speed of your rotation during your swing and you'll increase your bat speed. Baseball Rebellion has come to this conclusion after years of research and training athletes at every level of the sport. We have the staff, tools, and technology to teach you how to efficient in your rotation, which will lead you to hit the ball harder and farther than ever before...and we'll be able to prove it to you! Our one-on-one instruction is the cornerstone of our BR U experience. You'll work daily with one of our five professional hitting instructors on improving your specific swing mechanics. The instructor will work with you to help unlock consistency and power in your swing that you never knew you had. The individual attention you will receive will allow you to develop more efficiently and effectively during your time at BR U. Baseball is a competitive sport. You need to be a competitor in order to succeed at the college level. That is why it is important to us at BR U to make sure you train part of your day in a group environment. Each day you will learn and train beside other BR U clients during a group instruction period. This is an amazing opportunity to improve with the help of not only the Baseball Rebellion instructors but also the other clients. You will also have the opportunity to work in a live at-bat setting, where we try to replicate a game like atmosphere. The group instruction period is a great time for you to not only hone your skills but also build your mental toughness! At BR U, we want to make sure you understand the mechanics of your swing. A portion of your day at BR U will be spent analyzing your in-game swings from the season before and your Baseball Rebellion training swings. 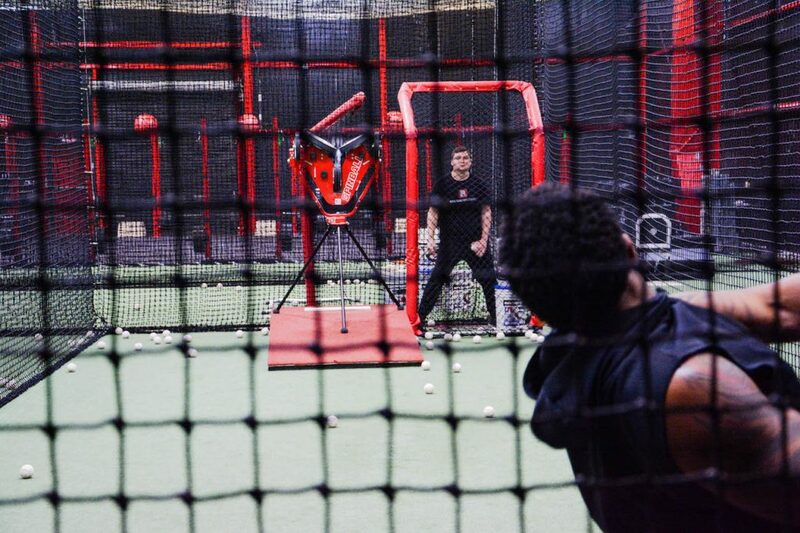 A Baseball Rebellion instructor will work with you to identify strengths in your swing and possible areas of improvement that you can bring into your next day of training. Sign up anytime between May and August. Payment plans available. Pay only 25% down on your training! Click an option below to learn more! Still have Questions about BR U?